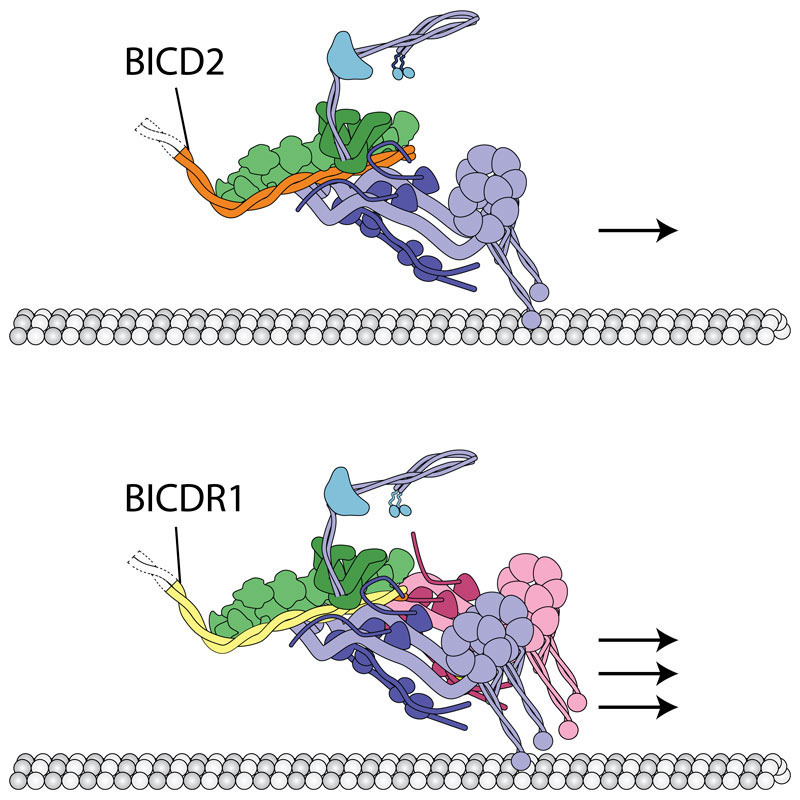 Binding of cargo adapter BICDR1 to dynactin recruits two dynein motor proteins and results in increased velocity and force compared to the motor protein complex with cargo adapter BICD2. Cytoplasmic dynein-1, a protein that transports cargos along microtubule tracks throughout the cell, binds to dynactin and cargo adaptor proteins to carry its cargos over long distances. Various cargos use different adaptors to recruit dynein for transport. Until now, it has not been clear whether all cargos recruit dynein in the same way and how different cargo adaptors act. Research by Andrew Carter’s group, in the LMB’s Structural Studies Division, along with collaborators in Ahmet Yildiz’s group at the University of California, Berkeley, have found that two cargo adaptors, BICDR1 and HOOK3, bind to dynactin in different ways and recruit different numbers of dynein. The study shows how cargos of the molecular motor dynein can alter the motile properties of the motor complex: when two dyneins are recruited, both the velocity and force of the complex are increased compared to the single-dynein complex. The study used a combination of electron cryo-microscopy and single molecule techniques. Dynein-dynactin-adaptor complexes were placed onto microtubules to investigate how they move. In these experiments two different dynein samples were used, labelled with different coloured fluorophores. Many moving complexes labelled with two colours were seen, showing that some complexes contained two dyneins. It could also be seen that two-dynein complexes moved faster than one-dynein complexes, and could still walk under higher loads. The discovery that different numbers of dyneins can be recruited by different cargo adaptors was unexpected. It suggests that different cargos could use different adaptors depending on their requirements for transport, for example, large cargos such as the mitochondria, need more force to pull them. One surprising aspect is that linking two motors together increases their overall speed – if you just tie two runners together, they won’t run any faster. It is thought that dynactin is a special natural scaffold, which arranges the two dyneins together in a way that allows them to coordinate with each other. 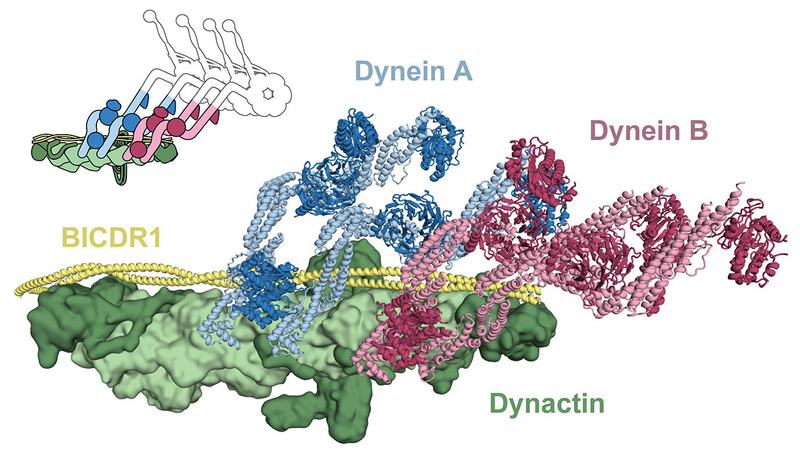 Dynein alone steps sideways and backwards, as well as forwards. This arrangement of two dyneins could restrict the number of side steps and back steps, resulting in faster forward motion. The use of electron cryo-microscopy also revealed, for the first time, the atomic structure of the flexible dynein tail domains, in complex with dynactin and a cargo adaptor. This shows how the two dynein tails are arranged on dynactin and why some adaptors recruit one dynein whereas others recruit two. This is a major advancement as dynein is generally a challenging protein to characterise, due to its flexibility. This high-resolution structural information may also help us to understand how mutations in the components of the dynein machinery lead to neurodegenerative diseases and developmental disorders. The work was funded by the MRC, the Wellcome Trust, NIH and the NSF.